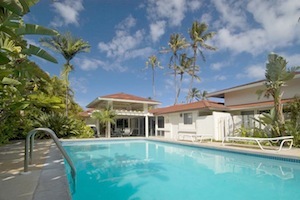 A lot of people are willing to have their very own residence in Kailua if they had the financial means. In Hawaii, Kailua is one of the best places you can find premium real estate properties, and with commanding prices too. Many celebrities are residents of this magnificent community, especially in the Lanikai neighborhood. You need not to look far if a quality Kailua real estate is what you are looking for – this website is dedicated for this purpose. It doesn’t matter if you are looking to buy or sell a Kailua home, all the information you’ll need can be found right here. Homes make up a large percentage of the Kailua real estate, although there are also quite a few townhouses and condominium units to choose from. Condominium units such as Poinciana Manor, Gardenia Manor, Hokulani and Windward Passage are centrally located in Auloa St and Auloa Pl. It is important to note, however, that beachfront condominiums are not available in all of Kailua, and the number of units available here are quite limited when compared to other places in Hawaii. Big townhouse complexes can also be found here, such as Lanika’s Bluestone, as well as other smaller areas such as the ones surrounding Enchanted Lake. Due to the limited number of multi-family properties in Kailua, prices of condominiums and townhouses here are much more expensive than in other locations. Kailua is a perfect place to find exquisitely designed homes in the middle of a vast neighborhood. Every home is designed to be unique – this means potential home owners surely have a lot to choose from. Enchanted Lake is the biggest neighborhood in all of Kailua. It was built in the 70’s with a man-made lake in its center. The lake was designed to have ocean water flowing through it, although tourists and residents are advised against swimming in it. The nearby community of Keolu Hills and Kailua Bluffs present an overlooking view of this spectacular lake. Although these neighborhoods are already quite old, most of the homes here were already remodelled or have undergone renovation. For individuals who wish to reside in a Kailua waterfront property, then Beachside and Lanikai are the perfect places to get one. Any of these neighborhoods can offer large waterfront estates which have commanding prices of up to $15 million! There are also other residential estates available worth around $1 million that are a just a few blocks away from the beach. Listing courtesy of Kim E. Miller.